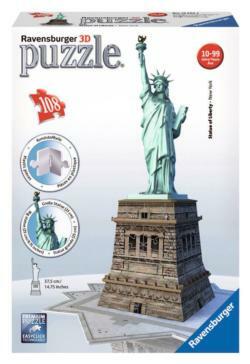 A Complete List of Jigsaw Puzzle Reviews by Jigsaw Junkies! Jane Holmes, the founder of Jigsaw Junkies, lives in Lancaster County, Pennsylvania with her husband and menagerie of animals. She has loved puzzles of all kinds since childhood, and spent over twenty years as a computer game designer. 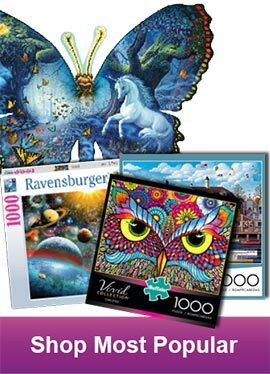 These days, Jane writes novels and indulges her love of puzzles through her large jigsaw puzzle collection and working on the Jigsaw Junkies blog. 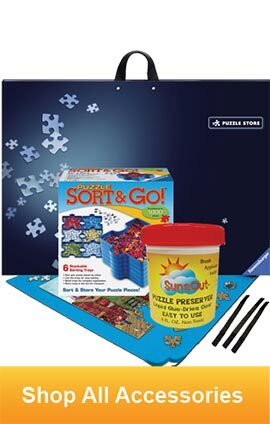 This is a gorgeous and fun-to-assemble shaped puzzle from Sunsout. The garden is filled with vibrant flowers, colorful birds, cute animals, and other surprises to discover as you assemble it. I really loved the soft art style, which feels airbrushed. The image is full without feeling crowded and there’s no real ‘background color’, dead space, or dark areas. 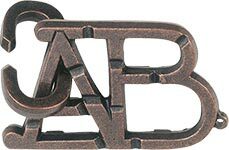 Assembly is of moderate difficulty but everything has a unique color or texture, so if you reference the box lid, you can always tell where a piece goes. The Sunsout quality is excellent with thick, sturdy pieces and a wonderful random cut. I particularly liked the unusual, fan-shaped border, which was a nice change from rectangular puzzles. Highly recommended. 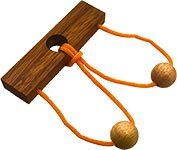 I loved shaped puzzles. There aren&apos;t that many released each year, so I treasure the good ones when they come along. 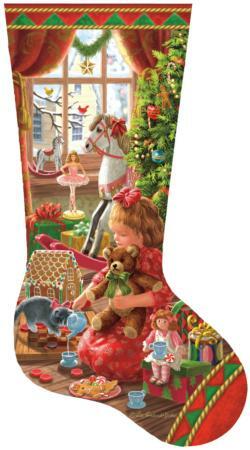 This stocking-shaped Christmas puzzle is really delightful. The curved border is fun to work with and the image is filled with bright colors and patterns that keep you moving from one object to the other without wanting to stop. I love the quiet scene by the Christmas tree and the soft, painterly art style. The Sunsout quality is excellent too, with sturdy pieces and a fun random piece cut. Highly recommended. Our rating: 9.25/10. See the full review with photos here. 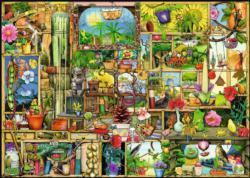 I adored this 1000 piece Susan Brabeau puzzle from Sunsout. It’s a fun image that has large characters, a variety of easily-recognized colors and patterns, and a sweet little visual story. The Sunsout quality is very good with random-cut pieces and faithful reproduction of the details and colors of the original painting. Assembly is quick and relaxing thanks to the various dresses on the ladies, the ornate hats, and the unique colors and textures on the four cakes. Once you start it, you’ll be tempted to keep going until the last piece is placed. Highly recommended! Our rating: 9/10. Read the full review with photos here. This is an easy-to-moderate difficulty puzzle. I love shaped puzzles, and this offering from Sunsout and Aimee Stewart is really gorgeous and fun to assemble. 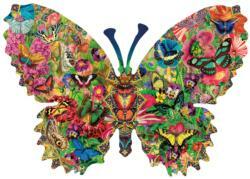 The image is filled with a variety of brightly-colored butterflies and flowers in different colors and patterns, and those are easy to assemble. The fill around them--greenery and a blue pattern--appears in small doses and wasn&apos;t too difficult. I really liked assembling the irregular edge, especially the antenna. Cute! The Sunsout quality is very good with thick pieces and a fun random cut with a wide variety of piece shapes. The fit is fairly tight so you can move groups of assembled pieces around with care. Another fun feature of this puzzle is "whimsies"--some pieces were shaped like an umbrella, butterfly, and other recognizable objects. Highly recommended. Our rating: 9.5/10. See full review with photos here. “Castle of Horror” is an absolute masterpiece of a puzzle. The art by Jean-Jacques Loup is outstanding. Dozens of scary movie tropes are included in this image in a humorous way, from Frankenstein to ghosts, witches, and vampires. 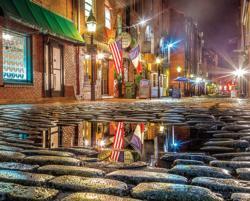 The image is filled with detail without being overcrowded or too busy, and the night time palette is bright and appealing. 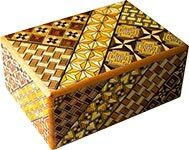 This is a moderately difficult puzzle, mostly due to its size, so prepare to buckle in and enjoy a long puzzling experience. There are dozens of funny scenarios going on around the puzzle, which you’ll discover as you assemble it. The different areas, like the castle walls and the brown cliffs, have different textures so it’s not too hard to figure out what piece goes to what area by referring to the included poster. The Heye quality is good with a gorgeous triangular box, large poster, thick and sturdy pieces, and excellent image reproduction. This is a grid-cut puzzle with a good variety of piece shapes. A piece never seems to fit where it doesn’t belong. The interlock is a bit on the loose side, so use care when moving around assembled pieces. 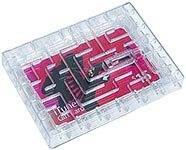 This puzzle was originally produced in 2003 and was out of print for a number of years. Don’t miss a chance to get this classic while it’s back in print. Highly recommended! Our rating: 9.75/10. Read the full review with photos here. 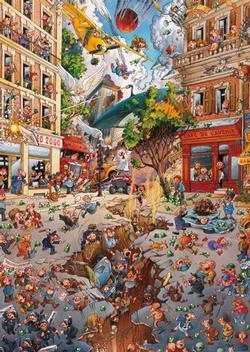 “Christmas Chaos” by Francois Ruyer is a fun but moderately challenging Christmas cartoon puzzle. 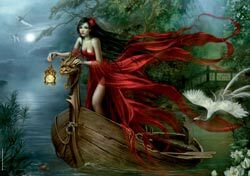 The artwork is beautifully executed with tons of color and detail. The repeating elements of similar-looking elves and gift boxes scattered throughout the image are tricky, but there are some anchoring elements such as the windows, fireplace, toys, and Christmas tree, which help fill in much of the design. I found myself referring to the box lid often to figure out which piece of elf went where. The Piatnik quality is very good with thick, sturdy pieces, a grid cut, a fairly tight fit, and a nice matte finish. If you like a little more challenge, Christmas puzzles, or cartoon puzzles, this is highly recommended. Our rating: 9/10. See the full review with photos here. 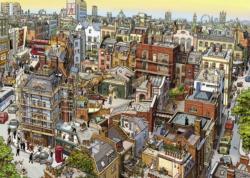 This was fairly difficult for a 1000 piece puzzle. The art style is loose, not highly detailed, so at the beginning it felt like I just had a lot of brownish pieces with vague stuff on them. There’s a lot of brown–with the gold colors, flesh tones, and actual brown in the image. It seemed like I had to focus more than usual to pick out the detail on each piece and ‘resolve the vagueness’. 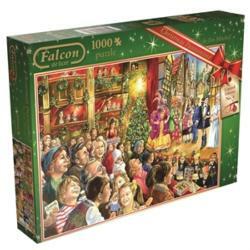 A nice edition to Falcon’s relatively new limited edition Christmas puzzle series (see our page on Christmas puzzle series). I would definitely buy more Jim Mitchell puzzles in the future, and I hope Falcon continues the LE Christmas puzzle series. Read More at JigsawJunkies.com. I’d rate this puzzle as ‘medium to difficult’. 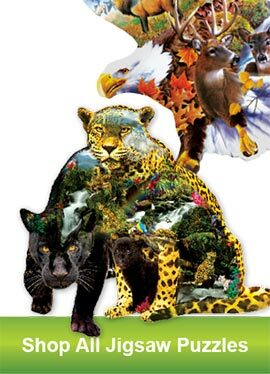 Heye puzzles, like JVH puzzles, are filled with detail, so you need to refer between a piece and the poster image to see where a piece goes rather than work on large areas of color and pattern. 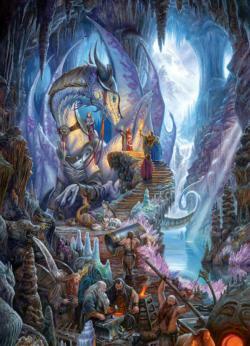 The dragon and castle in this image are fairly straight forward to assemble, as are the orange pumpkin and blue stream. 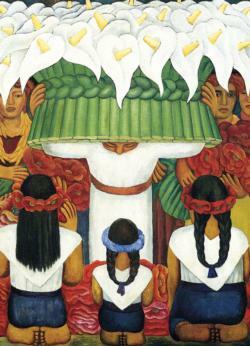 But most of the figures are surrounded by green, so you do need to work from the poster a lot. 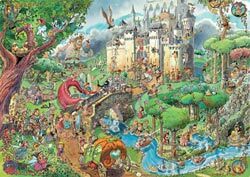 “Fairy Tales” is another very solid cartoon puzzle from Heye and a nice size at 1500 pieces. I always look forward to their new cartoon releases and hope we get more Prades, Loup, and Degano for years to come. Read more at JigsawJunkies.com. 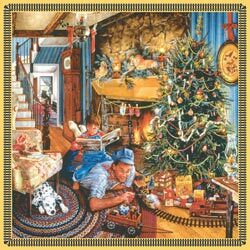 “Father’s Christmas Train” is a cute Americana painting by Susan Brabeau that’s been made into a 500 piece puzzle by Sunsout. At the heart of the painting is a dad having a grand time playing with trains while his disinterested son reads a book. The cozy living room is decorated for Christmas and there’s a definite nostalgia vibe to the image. The Sunsout quality is very good, with sturdy pieces and a fun random piece cut. I like that you can move around a set of joined pieces without them falling apart. 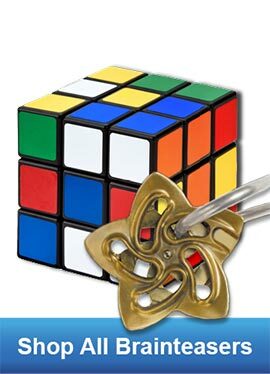 This is an easy puzzle that you can do in a single setting and would be good for kids and seniors. Recommended. Our rating: 8.25/10. See the full review with photos here. 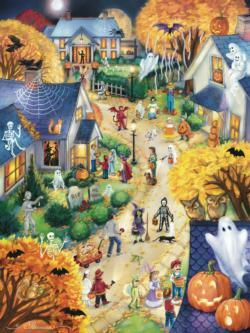 I loved assembling this Halloween puzzle! 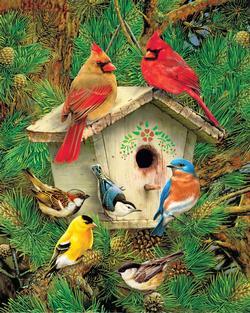 The image by Randy Wollenmann has bright colors and patterns that make assembly easy, quick, and super fun. It was so much fun I completed the puzzle in one session because I just had to do the “next little bit”. The Vermont Christmas Company quality is good with hard, solid pieces. The cut is mostly a grid cut, but not all edges line up and some sides have wavy and diagonal edges. This gave the puzzle a unique personality, and I enjoyed working it. This puzzle is easy enough that it makes an ideal family puzzle. It’s the best of the 2016 Halloween season! Rating: 9.25/10. Read the full review and view photos here. 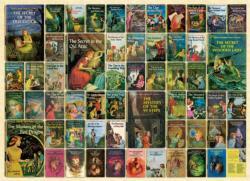 "Nancy Drew" is a fun collage puzzle that will bring back fond memories for those of us who grew up reading Nancy Drew. 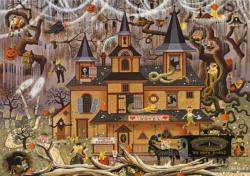 The book covers themselves are retro works of art with faux spooky designs that are a pleasure to puzzle. The Cobble Hill quality is good with random cut pieces in a wide variety of shapes that run from normal to small in size. The pieces have a linen finish which helps reduce overhead glare. This puzzle is of medium difficulty. 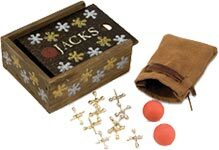 All the letters in the book titles help, but I did refer to the box lid quite often to figure out where a piece went. The five large books in the image are a good size but the smaller books are a bit small to see all the detail. 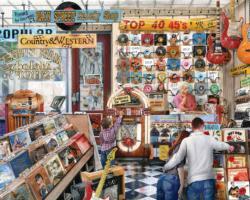 If you grew up with Nancy Drew, or like vintage art, you&apos;ll love this puzzle. Recommended. To read the full review and see the photos, click here. 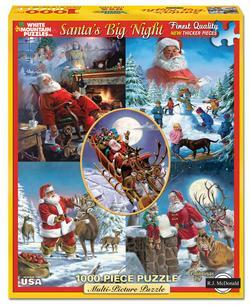 White Mountain&apos;s "Santa&apos;s Big Night" is a classic Christmas puzzle you&apos;ll want to add to your permanent collection. 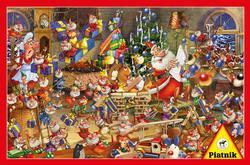 The image is ideal for puzzling with five separate Santa scene vignettes. The colors are bright and cheerful, and the painted artwork couldn&apos;t be more Christmassy. 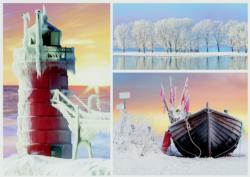 I especially loved the scene in the upper right with the snow-covered fur trees and the children playing in the snow. 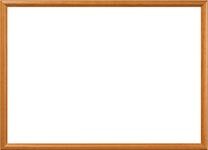 This is an easy-to-moderate puzzle that would be perfect to work with a group at Christmas, given the layout of the various story panels. The quality is quite good. I especially like White Mountain&apos;s larger piece size and very flat, smooth finish. Highly recommended for everyone this holiday season! Our score: 9/10. See the complete review with photos here. Slow and steady wins the race, as they say. A 2000 piece puzzle like this isn’t designed to be completed in a day, but it’s nice to have a longer ‘project’ from time to time. I really enjoyed seeing the details in the image, like footprints, and the various characters, as the puzzle progressed. This is my favorite of the new Heye releases this year, which pretty much puts it at the top of the 2016 best puzzles list! I recommend it to anyone who thinks they’re up to a 2000 piece challenge! Read More at JigsawJunkies.com. 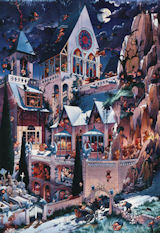 This fairy tale puzzle of "Snow White" is one for the adult puzzler. Its use of random patterns adds a nice challenge to assembly, but it&apos;s not frustratingly hard. The colors are bright and cheerful, and there are a lot of details woven into Snow White&apos;s skirt for you to discover as you puzzle. 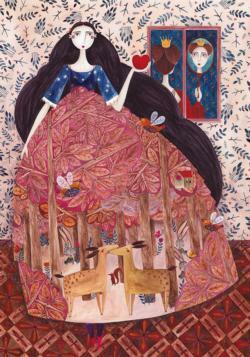 The lovely folk art style illustration is by Romanian artist Kurti Andrea. The D-Toys quality on this puzzle is good with sturdy pieces, six different piece shapes (in a grid cut), and a nice flat finish. 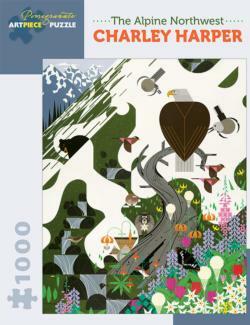 Recommended to fans of folk art, fantasy puzzles, and those looking for a little bit of challenge. Moderately difficult. Our rating: 8.75/10. Read the full review and see photos here. If you&apos;ve up for a challenge, "Story of Wine" by Francois Ruyer is a ton of fun. The image is super cute with lots of crazy characters and vibrant color. 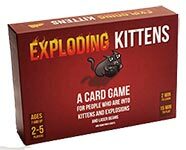 There are plenty of jokes and mini-stories to reveal as you assemble the pieces. The Piatnik quality is very good with thick, sturdy pieces, a grid cut, a fairly tight fit, and a nice matte finish. 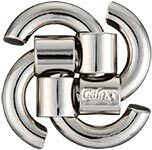 However, there are lots of similar two-knob, two-hole pieces which make a few areas, like the random red tiles on the roofs, challenging because pieces can appear to fit where they don&apos;t go. There&apos;re also lots of repeating elements such as the big red noses. This isn&apos;t a fast and easy puzzle, but it is rewarding and very satisfying to complete. 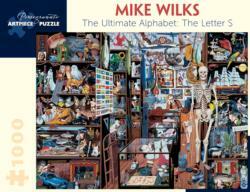 Recommended if you like busy cartoon puzzles or are looking for something to keep you occupied for a good while! Our rating: 8.75/10. See the full review with photos here. Our rating: 9.5/10. Read the full review and see photos here. White Mountain’s “Tapestry Cat” is a fun and challenging puzzle with moderate difficulty. 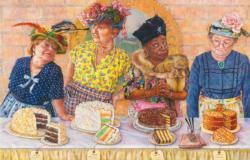 The image by artist Lewis T. Johnson has bright colors and a lovely hand-drawn art style. 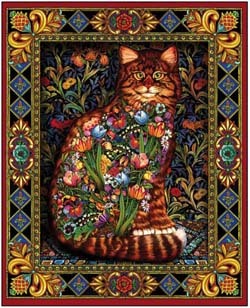 Big bold elements–such as the large border, the Morris-esque wallpaper background, the cat, and the floral bouquet inside the cat–make separate distinctive areas to assemble. Repeating elements within the border (like the blue diamonds) and within the floral bouquet (for example, white daisies) make the puzzle more challenging but never frustrating. The White Mountain quality is good with larger pieces and a random cut. 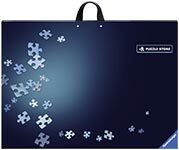 The final puzzle has a flat, smooth finish that allows you to see the art rather than the jigsaw cut. The finish is glossy, so there is some glare under bright lights. Highly recommended! 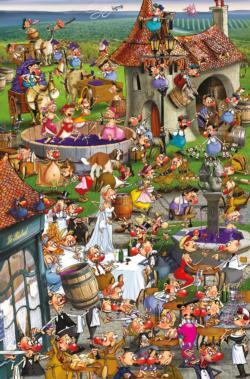 This puzzle is difficult for a 1000 piece puzzle. It is so busy and there are little spots of similar color all over the place. That makes it hard to take an ‘area by area’ approach. There were a few areas that could be worked independently–the sunflowers box, the box with the blue background, and the waterfall area. But most of the puzzle requires referencing the box lid and comes together in little dribs and drabs. 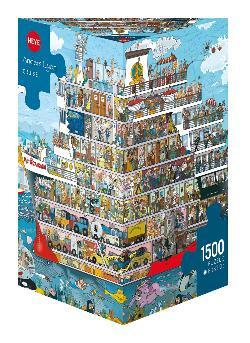 Another fun Colin Thompson puzzle from Ravensburger. What’s not to love? Read More at JigsawJunkies.com. This is Victoria’s first submitted review. Thank you, Victoria! This is a challenging puzzle to assemble because there are very few large areas of color or pattern and the colors are distributed around the image. For example, the bits of yellow in the image below are spread out in different parts of the scene. I relied heavily on the box cover for assembly, and it would be quite hard to do without this reference. 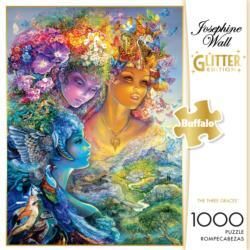 This is a very unique and high quality puzzle that would make a wonderful gift. It should also be highly collectible. I love that it’s part of a series and that we’re like to see many more! Great job, Pomegranate and Mike Wilks. Read More at JigsawJunkies.com. 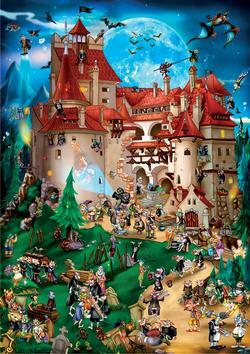 "Transylvania" from D-Toys is a fun and easy cartoon puzzle to assemble. 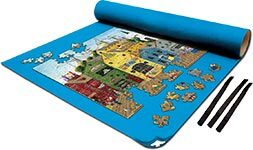 The different areas of blue sky, red roofs, cream castle, tan road, and green grass make this puzzle go together very quickly. The artwork is a lot of fun with dozens of characters, each with a unique costume and pose. Human tourists snap photos and watch the antics at the Transylvanian tourist attraction--loaded with rather silly vampires hanging around, cooking food, or putting on a show. The D-Toys quality on this puzzle is good with sturdy pieces, six different piece shapes (in a grid cut), and a nice flat finish. 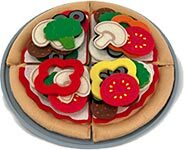 If you like cartoon puzzles, the D-Toys "Cartoon Classics" line is worth a try. Recommended. 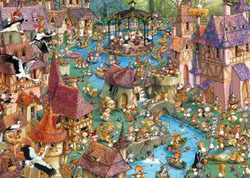 You&apos;ll find lots of interesting details in this puzzle as you "treasure hunt" among the books. 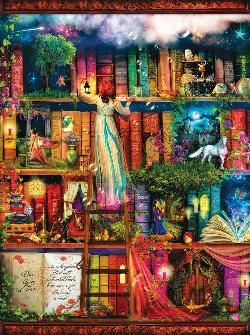 The fantasy image by Aimee Stewart features a rainbow of brightly-hued books and interesting elements arranged among them, such as dancers, jewels, notes, and Aladdin&apos;s lamp. 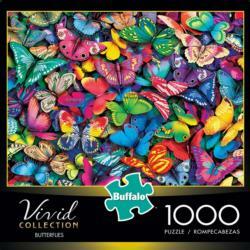 The puzzle is easy-to-moderate to assemble with many bright and distinct colors. The Sunsout quality is very good with thick pieces and a fun random cut with a wide variety of piece shapes. The fit is fairly tight so you can move groups of assembled pieces around with care. The final puzzle is frame-worthy. Recommended. Our rating - 9/10. Read the full review and see pictures here. 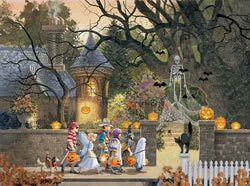 I love this 500 piece Halloween puzzle from Charles Wysocki and Buffalo Games. The artwork has a wry, adult tone reminiscent of Edward Gorey. The scene is populated by strange creatures, pumpkins, cobwebs, and tongue-in-cheek signs like “Rooms to Ferment” and the “Pithias Bloodlust Wrinkledeath” motto on the hearse. The puzzle is mostly easy but the forest behind the mansion has a random pattern which offers a little more challenge and makes the puzzle overall more satisfying to complete. The Buffalo Games quality is quite good. The pieces feel thick and are pleasant to work with. 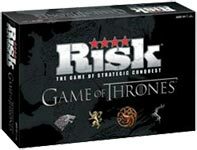 It comes with a poster in the box so you have a larger image to work with. There is some glare off the glossy surface under strong overhead lights. This puzzle is a real treat. Highly recommended! 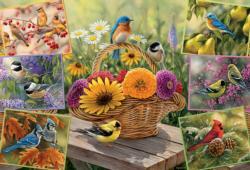 This beautiful winter collage puzzle is a super easy and relaxing puzzle to assemble. 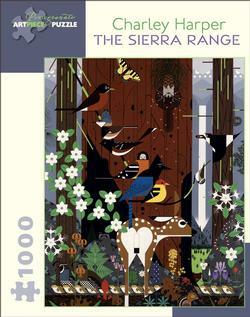 The distinctive colors, and the three separate photo scenes, make the puzzle go together quickly. The Trefl brand from Poland is a grid-cut puzzle with standard piece shapes and sizes. 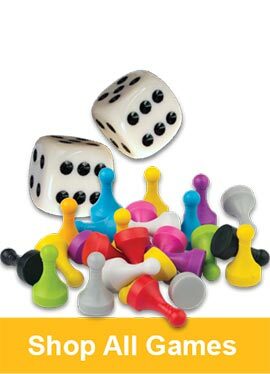 The pieces are not as thick as some Euro brands like Ravensburger or Jumbo, but thick enough to resist bending and damage. 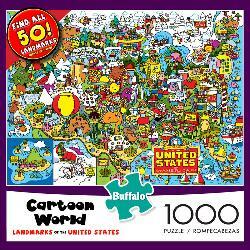 Recommended for children, seniors, and anyone who enjoys 500 piece puzzles.